Bart Hasselfield is one of our newer members, and he has a terrific website that he wants to share with us! After reading MRC Blog Editor Paul Ullrich's posts about his recent rail trip to Churchill, he sent us these links from his website, http://www.zambonista.com, about the making of the rail line to Churchill. Bart also has a very personal connection to the Railway. His grandfather was Major J.G. 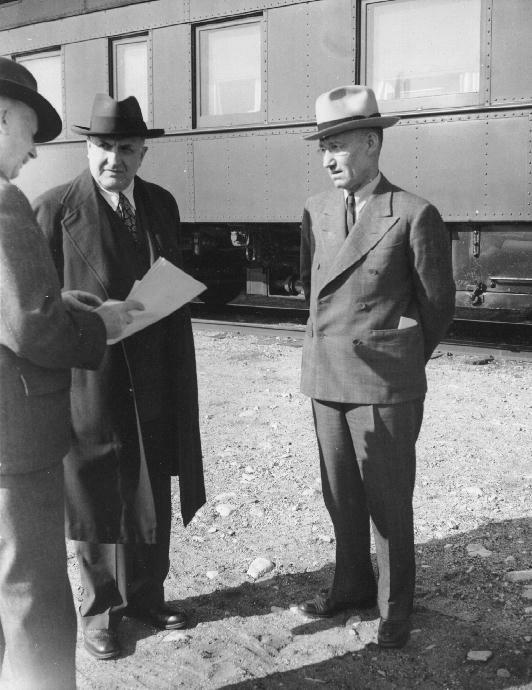 MacLachlan, who was the manager of the Hudson Bay Railway from 1943 to 1951. He had served on the railway since 1928 in various roles, including Division Engineer, District Engineer, and Superintendent and District Engineer. Bart has posted excerpts from his grandfather's memoirs and several photographs of the rail line from 1929. Boy, was there a lot of snow that spring! You can see it all by clicking here. MacLachlan is shown above right with CNR President Vaughn and CNR Vice President Devenish. Kids just love the Gateway Western Railway!